Boston Properties and TMG will acquire and develop Platform 16, an urban campus near Diridon Station, which is one of the region’s most prominent locations as home to more than 120 technology firms. Platform 16 is a 1.1 million-square-foot class-A office project that is adjacent to Google’s transit village (credit: TMG). 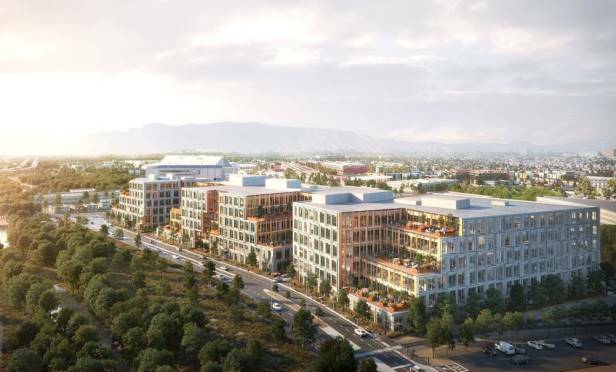 SAN JOSE—Boston Properties Inc. announced today that it has entered into agreements with an affiliate of San Francisco-based TMG Partners and Valley Oak Partners to acquire and develop Platform 16, an urban campus near Diridon Station in downtown. Platform 16 is a 1.1 million-square-foot class-A office development located on a 5.4-acre site that is adjacent to Google’s planned 8 million-square-foot transit village and Diridon Station, the largest multi-modal transportation hub in the Bay Area consisting of Caltrain, VTA light-rail, the ACE train, and the planned BART and high-speed rail lines.